If you’re looking to strike black gold, Australia’s tastiest truffle extravaganza is just around the corner. There aren’t too many benefits to Perth’s winter, but from June to September, the annual truffle season kicks off in Manjimup. Bellies are warmed, mouths water and hearts are content. Everything we crave in the cooler months. Eating delicious food is proven to encourage high spirits. It makes for a good excuse to indulge in great food throughout winter too. Comfort food makes you happy. Add truffle oil to the mix and you have an intense, luxurious flavour that adds charm to almost any dish. Truffle oil is a flavoured oil which can be used as a finishing ingredient in a variety of foods. A small touch of it will add a subtle, earthy essence. 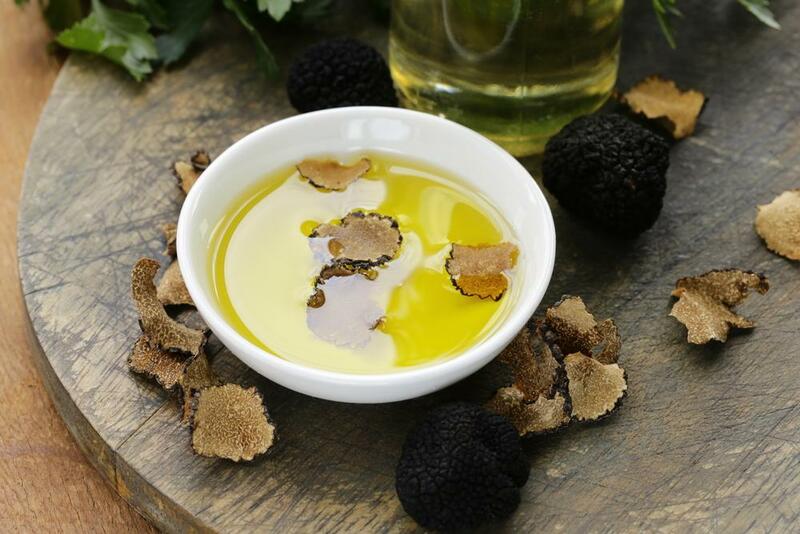 Truffle oil can be purchased as black or white truffles. Black truffle flavoured oil is intense and complex, complementing potato and egg-based dishes. Think truffle oil French fries or mashed potato. It has an earthy taste with hints of chocolate or red wine. White truffle oil is ideal for Italian food such as pizza, risotto or pasta. It can have a garlic or nutty flavour. Both truffle oils are like perfume – less is definitely more. Chomp Chomp have a delicious recipe for truffled vegan and mac cheese. It’s creamy, homely and adds a classy twist to an old winter favourite. The local Perth blogger’s version of mac and cheese is suitable for both vegans and gluten-free diets. It’s best topped with a combination of grated fresh black truffles and truffle oil, offering your taste buds the best of both worlds. Grab your share of black truffles from the Manjimup truffle kerfuffle festival from June 22nd. Fries have always been one of those naughty comfort foods we can’t get enough of. Bake them and drizzle with truffle oil and you have yourself a fancier, healthier alternative. If that truffle delicacy has you hook, line and sinker, add a dash of our Ogilvie & Co Truffle Salt for that extra wow-factor. 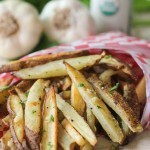 Combined with garlic-goodness and saltiness of the fries – your taste buds are in for one big surprise. Truffle oil and Italian food go together like wine and cheese. If you have a love affair with European dishes, amplify the flavour and intensity with truffle oil (and freshly grated truffles, if you dare). This truffle oil pasta recipe takes comfort food and tastiness to new level. Topped with mushrooms, because let’s face it, you can never get enough of them. For food-lovers who are obsessed with Italian food, add truffle oil to other favourites such as bruschetta. Pile your preferred bruschetta toppings on crusty bread and drizzle with truffle oil. Other ingredients that work well with this combination are fresh garlic and balsamic vinegar. Winter is the ultimate time for couch dates, complete with a bottle of wine, movies and of course, the essential – popcorn. Whether you want to be more fun-gi around your friends or you’re self-indulging (because you want the deliciousness all to yourself), truffle popcorn is always a hit. Upgrade regular popcorn with drizzled truffle oil or get creative in the kitchen and make truffle butter. Whichever way you have it, truffle popcorn is the perfect balance of truffle-y-goodness and buttery, salty popcorn. You won’t need dip with these truffle-infused treats! Oven-fried truffle potato chips are loaded with zest and seasoning, making it easy to devour an entire batch. They’re easy to make and pair perfectly with a cold beer. Get the recipe here. Be sure to make extra as they can be stored like regular potato chips in a sealed container to save for a rainy day. Well, depending on your self-control. Shepherd’s pie is another comfort food favourite. Make your chosen version of shepherd’s pie and load with truffle oil and a fluffy mashed potato topper. You can also use black or white truffle oil to revamp mash potatoes. Prepare with a generous amount of butter and cream. Drizzle truffle oil on top. If there’s fresh truffles in the fridge, grate a little over for a texture and taste overload. Different flavours of truffle oil may be used for seasoning combos. If you’re having friends/family over and want to create a party-pleaser platter, cheese boards are always a hit. Choose a variety of melts and slices, paired with nuts and fruits to add delicious weight to the dish. Sprinkle truffle oil over the cheese for a flavoursome kick. Alternatively, if you’re feeling adventurous, make your own flavoured cheese with truffle oil and chive for seasoning. This vegan recipe has all the cheesy-goodness without the dairy. 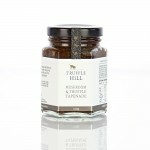 Our mushroom and truffle tapenade blend is a delicious addition for cheeseboards. Seafood, especially fish, is another staple to be enjoyed with truffle oil. You can include the truffle oil separately to dip the fish into, or drizzle over other seafood delights such as freshly shucked oysters or prawns for a bolder flavour. Many kids will agree that there’s nothing delightful about veggies. Sprinkle them with a little truffle oil, however, and prepare those taste buds for a refreshing and scrumptious kick. Great for kids who struggle to eat all their veggies or the adult that craves something offbeat. If you’re stuck for inspiration, sweet potato, corn, asparagus, cauliflower and mushrooms are the best veggies to use. The Europeans do it right. In fact, truffle oil is used as a special ingredient for many cocktail and Vodka drinks, including Martins and truffle tequila. Yes, you read right. Truffle tequila! The truffle oil makes for a smoother and easier-to-drink flavour, ideal for those harder liqueurs. Take the combination one step further and you have candy for grown-ups. Champagne truffles, winter cabernet truffle and other wine, beer or liqueur-infused truffles. If you can’t sink your teeth into these, crumble regular chocolate and truffle oil over dessert. From dinners, snacks, breakfast eggs and desserts, there’s not too many dishes that can’t be enhanced with truffle oil. Join the Truffle Oil Craze. Just in Time Gourmet has a love-affair with truffles. Why wouldn’t we? The uses for it in cooking and eating are almost endless! If you want to see what all the fuss is about, contact us today for the best truffle product recommendations. We also offer free delivery in Perth on orders over $50 and great delivery rates for Interstate orders, because we believe everyone should experience the truffle-craze.